Description: Granite cannon representation surmounting (and part of) large monument. The South face of monument has American flag with 13 stars above following: "Erected ~ Through The Efforts Of ~ Will Wendel Post No. 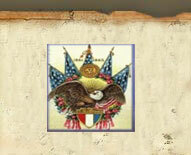 46 ~ Department Of Kan. Grand ~ Army Of The Republic And ~ Their Auxiliary Womans ~ Relief Corps No. 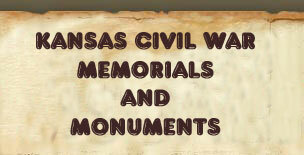 15 ~ Dedicated To The Memory ~ Of The Union Soldiers And ~ Sailors For Their Service ~ In The War Of ~ 1861-1865". On a lower basal slab is inscribed: "May 30, 1916". Description: The Chapel at the cemetery has a cornerstone reading: "Erected By The ~ People ~ Of ~ Holton & Vicinity ~ 1913". 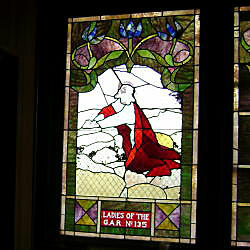 In the chapel is window dedicated the "Ladies Of The ~ G.A.R. No. 135". Some of the color on the window has faded badly. Description: Cannon replica on concrete base, pointing SW. Base may be original; granite panel inset on SE face of base reads: "Dedicated ~ In F. C. & L. ~ To The Union ~ Soldiers & Sailors ~ Of The War ~ 1861-1865". A gray limestone(?) 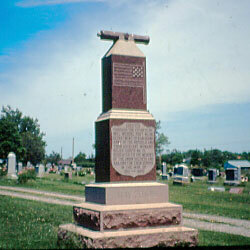 panel bolted onto the NE face of the base reads: "Civil War Cannon ~ Replica ~ By ~ Holton National Guard ~ V.F.W. & Amer. Leg. ~ Courtesy Of ~ Denison & KS. State Banks ~ People Of Jackson County ~ Orig. 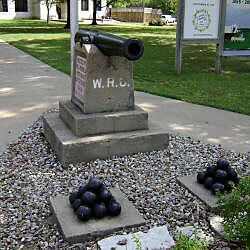 Cannon Donated To ~ W.W. II Scrap Drive ~ Sept. 8. 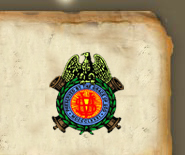 1942 ~ A Bicentennial Project".